Belly up to these favorite spots for the most important meal of the weekend and Mother’s Day. Only Brunch service hours are listed in this article. For complete restaurant info, including directions, follow links to individual listings in our comprehensive Seattle restaurant guide. Bastille Café & Bar [FRENCH] The hyperlocal mission that guides this restaurant’s menu extends through the weekend, naturally. The house-made granola is sweetened with honey from the rooftop apiary and is accompanied by a pitcher of milk from Vashon Island’s Sea Breeze Farm. House-smoked wild king salmon is embellished with tender greens grown in Bastille’s garden, also up top on the roof. The vast dining room is often packed, especially on Sundays when the farmers’ market draws fans to the streets of old Ballard. We’ll raise a glass to toast the brunch cocktail lineup, along with the fun fizzy drinks without booze. Sun. 10 a.m.–3 p.m. The Fat Hen [NORTHWEST] Such a charming, snug space, this bright white dining room practically shines, as does the eggscellent menu. Get ’em baked or poached and perched on a muffin, finished in silken hollandaise. But these Benedicts take a delightful detour, subbing pancetta or speck (prosciutto’s cousin) for the standard Canadian bacon. On the sweet side, the house-made granola is a hit, and don’t forget to ask for some handcrafted jam to smear on the thick toast. Sat.–Sun. 8 a.m.–3 p.m.
Monsoon East [VIETNAMESE] It’s dim sum and then some at this upscale Vietnamese venue, the younger sib of the Capitol Hill fixture. Yes, the flavorful pho and bun—rice noodle bowls—are available, but the breakfast-leaning options are extensive, too. Faves include duck confit hash, savory crêpes, the Dungeness crab Bennie and banana bread French toast. Sat.–Sun. 10 a.m. –3 p.m.
Boat Street Cafe [NORTHWEST] With such a handsome space that inspires ladies who brunch to dress up in their Sunday best, this tucked-away gem dishes up a brunch menu deep in updated classics: A chèvre and artichoke Bennie is a tart revelation, while the cornmeal custard cakes will make you forget all other flapjacks. The kale gratin tart makes us want to weep with joy. When it comes to the lunch specials, you can’t go wrong with the meatloaf. Yes, meatloaf. Daily 10:30 a.m.–2:30 p.m. Le Pichet [FRENCH] The broiled eggs and ham are legendary, but we’re tickled that it’s possible to order all sorts of charcuterie anytime of the day or night in this rustic chic bistro. Oh, that veal sweetbread terrine is a thing of beauty, set against a cool pool of watercress cream. If you’re on a breakfast mission, start with a bowl of the house-made yogurt drizzled with honey, emblematic of the simple and simply sensational fare here. A similar menu is offered at Café Presse, Pichet’s sister restaurant near Seattle U. Breakfast available daily 11:30 a.m.–5:30 p.m.
Tilikum Place Café [NORTHWEST] Ba Culbert’s comfy neighborhood hangout serves up a fine blend of breakfast and lunch dishes for the leisurely weekend repast, steps from the iconic Chief Seattle statue. Enjoy the satisfying signature Dutch baby pancakes—baked puffy to order, either sweet or savory—or, for something completely different, try a fragrant sardine sandwich. We’re crazy about the house-made sausage, the baked eggs, and eating those baked beans on toast is like a trip to a B&B in the English countryside. Sat.–Sun. 8 a.m.–3 p.m.
Kingfish Cafe [SOUTHERN] Can we get a “heck yes!” for the down-home fare at this landmark restaurant on Cap Hill? The Southern-style comfort food is served in platter-size portions and is consistently yummy. From the catfish and crab cakes to the Creole-inspired egg tart, the kitchen knows how to satisfy. Judging from the line out the door nearly every Sunday, we’re not the only fans. Sat.–Sun. 10 a.m.–2 p.m.
Vios [GREEK] Kids and their ’rents are crazy about this place, but the terrific menu is a draw with universal appeal. How can you not love a restaurant that serves falafel cakes on its Mediterranean breakfast plate? We’re also giddy about the Greek-style carbonara and the Benedict built on a foundation of latkes. While Mom and Dad sip on their well-seasoned Bloody Marys, the little ones can take a break in the special space reserved just for them. There’s a second Vios tucked into the back of Third Place Books in Ravenna. Sat.–Sun. 10 a.m.–3 p.m.
Geraldine’s Counter [AMERICAN] At this Columbia City diner, it’s breakfast anytime. Legions of loyal regulars love the ricotta pancakes and the city’s best French toast, thick and eggy-rich, not to mention the long list of scrambles and a chicken-fried steak big enough to split between two. The hash browns are crispy, and the servers are sassy, keeping those cups of joe topped off. What more could you ask for? A burger? Lunch is available anytime, too. Sat.–Sun. 8 a.m.–3 p.m.
Joy Palace [CHINESE] If Mom prefers har gow over hash browns and eggs, take her to this bustling dim sum spot near Columbia City. Crowds of local Chinese pour in during weekend mornings, and carts carrying steamed dumplings—peanut pork, shrimp and mushroom, shui mai—congee and fresh tofu weave their way through the busy dining room. It’s fun, affordable and delicious. Dim sum daily 10 a.m.–3 p.m.
Lola [GREEK] Octopus and eggs? That’s right, you can order that crazy delicious combo on the brunch menu at Tom Douglas’ joint with a Greek accent. Despite the Mediterranean-inspired menu, Lola offers one of the best versions of gravlax in Seattle, house-cured and served on onion-rye ficelle. Tater fans will cheer the red spuds—baked, smashed and fried to a crispy finish—a spicy ketchup on the side for dipping. Wash it all down with a jalapeño-infused Bloody Mary. Mom and Dad will celebrate the peachy keen kids’ menu, and everybody will get a kick out of those made-to-order loukoumathes, cinnamony doughnuts. Sat.–Sun. 7 a.m.–3 p.m. Taste at SAM [NORTHWEST] The sophisticated menu matches the stylish surroundings at this museum restaurant. The offbeat Sunday brunch offerings might even be dubbed avant-garde: The breakfast gnocchi are pancetta-fied, a poached egg on top of those delicate potato dumplings, while ricotta griddle cakes are the canvas for sugared huckleberries. Instead of waffles, chef Craig Hetherington pairs up fried chicken with biscuits and gravy, but keeps it from going over the top with a mess of sautéed greens. Three cheers for the brunch cocktails inspired by the featured exhibits. Sun. 11 a.m.–4 p.m. The Grange Cafe [AMERICAN] When a small-town day trip with a little antiquing is in order, a farm-fresh meal at this charming locavore eatery inside the old Grange Hall is just the thing. We love the challah French toast and the superb BLT. Don’t miss the spicy Bloody Mary served with pickled veggies in a canning jar. Sat.–Sun. 9 a.m.–2:30 p.m.
Revel [KOREAN] Bring on the monkey bread! This Korean street-food hot spot in Fremont puts a global spin on the midday weekend meal. The monkey bread, for instance, comes in sweet (cranberry, ginger and goat cheese) and savory (barbecued pork and spicy maple syrup) versions. Eggs come with scallion potato hash and, wow, the kalbi short rib burger is a dry cleaner’s dream—wonderfully messy. All that is subject to change, though, as Rachel Yang and Seif Chirchi constantly update all the offerings. Sat.–Sun. 10 a.m.–2 p.m.
Café Flora [VEGETARIAN] Yes, it’s a vegetarian restaurant, but even carnivores love this Madison Valley landmark, especially at brunch when the hearty dishes deeply satisfy. The hoppin’ John fritters are served alongside smoky collard greens. Lucky us! Biscuits and gravy get their meaty heft from mushrooms, and buttermilk pancakes are dressed up in blood orange sauce. Bloody Mary fans will never get bored, as the bar makes up a new recipe every weekend. Just the thing to sip while savoring a grilled tofu and wild mushroom Reuben. Sat.–Sun. 9 a.m.–2 p.m.
Hi Spot Café [NORTHWEST] This homey Madrona mainstay has been comforting us with breakfast for decades. Served daily, the lineup hits the spot with buttermilk pancakes, green eggs and ham, brioche French toast and a tofu scramble. Tasty twists include a Benedict finished with curry sauce, and a loaded potato dish aptly called “Mexi-fries,” heaped with salsa and three kinds of melting cheese. We appreciate the Morning Glory chai, Barnes & Watson teas and Fonté coffee drinks. Sat.–Sun. 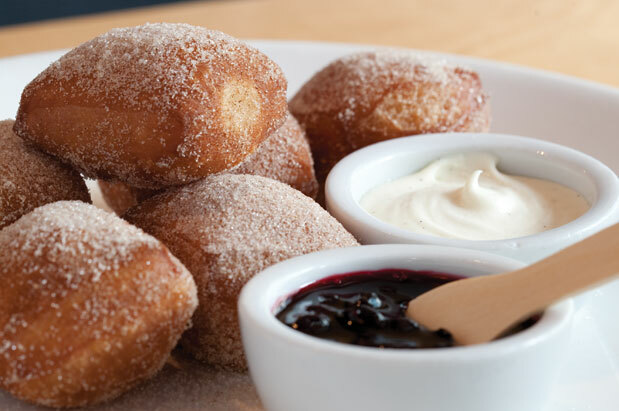 8 a.m.–2:30 p.m.
St. Clouds [AMERICAN] This inviting Madrona café offers not-so-standard takes on brunch favorites. That means chicken-fried steak and bacon gravy, fried rice tossed with marinated seitan, and a pesto-spiked collard green scramble. Whatever you choose, start by sharing a piece of Grandma Hazel’s sour cream coffee cake. It tastes like home. Sat.–Sun. 9 a.m.–2 p.m.
Chinook’s [SEAFOOD] They don’t call it brunch at this family-friendly venue, but the weekend breakfast menu is plenty grand, especially when it comes to the seafood-centric items. It’s no surprise, considering what’s just outside, the picturesque Fishermen’s Terminal. The salmon cakes are rightly famous, as are the Hangtown Fry, featuring fine, fat oysters, and fried Idaho trout. There’s also an ever-changing fresh sheet. No matter whether you go sweet or savory, every morning meal starts with a basket of complimentary warm scones and orange butter. Sat. 7:30–11:15 a.m., Sun. 7:30 a.m.–1:15 p.m.
Café Campagne [FRENCH] Some things never change, and thank goodness for the ongoing presence of super-rich croque madame, the terrific quiche and the Frenchy-est French toast, made with tender brioche, at this Pike Place Market icon. On a sunny weekend, there’s no place finer to linger than at the outdoor patio tables, and when the skies are gray, the dining room seems especially warm and welcoming. On the lunch side of the menu, it’s perfectly lovely to linger over the cassoulet or wolf down that succulent lamb burger. Of course, the bar will be happy to accommodate orders for a mimosa, but if you’re going to go authentic, make it a French 75. Sat.–Sun. 8 a.m.–4 p.m.
Toulouse Petit [SOUTHERN] This wildly popular nightlife destination calls its equally popular brunch “daytime escapism,” and we’re happy to get lost in a haze of crispy tasso ham cakes, bananas Foster pancakes and cured pork cheek hash. The menu is vast, but it would be a dirty shame if you didn’t save room for some beignets at the end. Daily 8 a.m.–3 p.m.
Pomegranate Bistro [NORTHWEST] Lisa Dupar’s homage to her Southern heritage has a decidedly Northwest feel. We love her low-country shrimp and grits just as much as the incredible eggs Benedict that sit on smoked salmon. There are no better oatcakes in the state, and the roasted mushroom tart is exceptional. Pint-size diners will enjoy the grown-up kids’ menu. To keep things interesting, chef Dupar switches up menus every season. Sat.–Sun. 9 a.m.–2 p.m.
Salish Lodge [NORTHWEST] The most picture-perfect brunch place in the Northwest, overlooking Snoqualmie Falls, this venue is loaded with historic import. Heck, the favorite menu has been served since 1916. There are à la carte options, but most diners go big or go home. The multicourse prix fixe feast begins with a basket of baked goods and a glass of freshly squeezed OJ before proceeding to the famous steel-cut oatmeal and, the really big finish, a platter heaped with three eggs, potatoes and three kinds of breakfast meat. If you’re craving lunch-type stuff, you’ll have to wait until after 11 to order smoked salmon chowder or a Caesar. Reservations are essential at this hallowed dining destination. Fri.–Sun. 7 a.m.–2 p.m.
Brave Horse Tavern [PUB] This adults-only venue serves up some flat-out fantastic brunch fare. The toasty pretzel with smoked salmon, house-smoked brisket hash, chorizo scrambled eggs and baked omelets filled with assorted savories seem designed just for the knockout lineup of eye-opening cocktails. Make mine a Beermosa (seriously)! While you’re waiting for the food to arrive, take a shot at the dartboards. Sat.–Sun. 10 a.m.–3 p.m.
Ma‘ono Fried Chicken & Whisky [HAWAIIAN] Bravo to Mark Fuller for his brilliant twist on the ubiquitous chicken and waffles, switching to French toast and finishing this odd duck combo under a blanket of sausage gravy and whipped cream. If you can get past that temptation, there are all sorts of compelling reasons to chuck any kind of diet: corned beef hash, croque madame or the mother of all egg and carb mash-ups, the Loco Moco. But this island dish rides a monster wave of tastiness with wood-grilled chuck, Portuguese sausage and brown gravy. In the mood to slurp? There’s a dynamite saimin, the island version of ramen, as well as oxtail soup. Bottomless mimosas, too! Sat.–Sun. 10 a.m.–2 p.m.
Salty’s [SEAFOOD] A knockout view from Alki and a massive buffet of all the brunch classics make this old-school spot wildly popular. Brunchophiles know how to pile it on, all-you-can-eat style ($39.95–$45.95), with Dungeness crab, peel and eat shrimp, baked salmon, oysters on the half shell, as well as omelets made to order and carving stations. Before the belts bust, check out all those desserts: cakes and pies and crêpes, oh my! Reservations are essential for all the big dates on the calendar. Sat. 9:30 a.m.–1:30 p.m., Sun. 8:45 a.m.–1:30 p.m. (live music). For more Seattle restaurant recommendations, search our complete online restaurant guide.